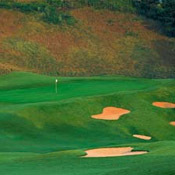 Set against the backdrop of the North Georgia Mountains, The Golf Club at Bradshaw Farm is one of Atlanta's finest golf experiences. This unique 27-hole layout, built on historic farm property, was rated in the "Top 10 New Public Courses in Georgia" by the Atlanta Journal Constitution. With a rating of 72.7 and a slope of 138, Bradshaw Farm is one of the most challenging courses in the area. This 27-hole par 72 layout plays up to 6,838 yards and features dramatic elevation changes, including a 100-foot drop off on the first and tenth tees. Along with the exceptional barn-style clubhouse, reminiscent of the great history attached to the course, Bradshaw Farm is proud to announce the addition of a 150-person banquet pavilion.